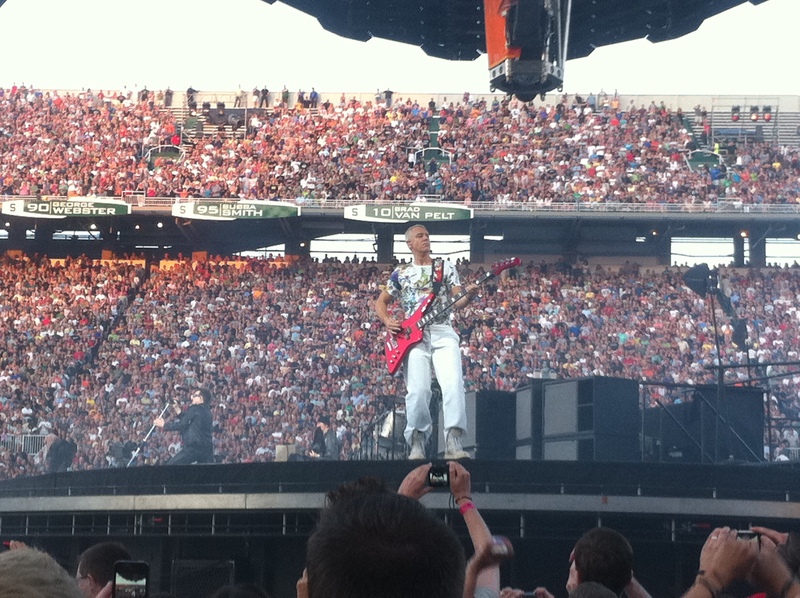 The U2 360 show at Michigan State in East Lansing was good. The same set list as Baltimore, except Hold Me Thrill Me Kiss Me Kill Me was played instead of Ultra Violet. It stayed light out through Elevation. This East Lansing show was the least crowded show I’ve been to, even though it was sold out. They didn’t sell many GA tickets, so there was plenty of room inside the inner circle and the rest of the floor wasn’t even half full. There were no red zones and the catwalk of the inner circle went almost to the stands. 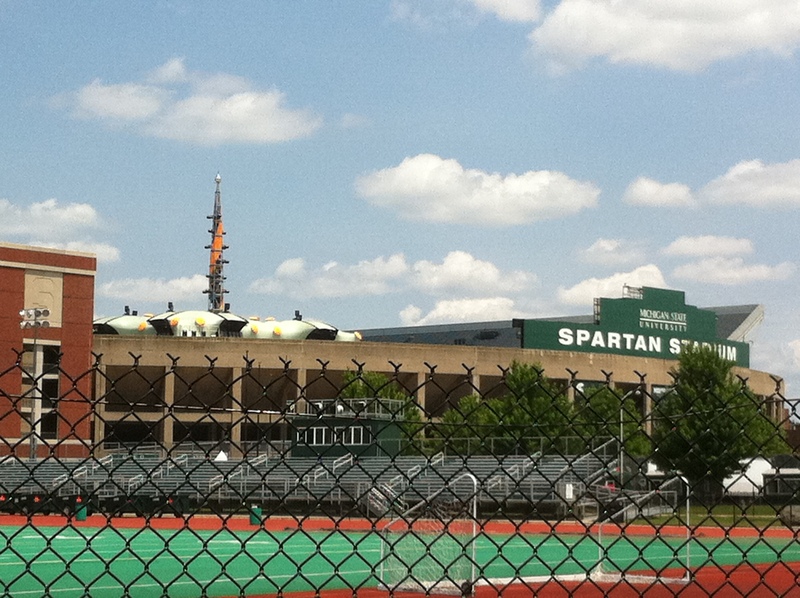 I started off my day in Michigan relaxing in my hotel room, ordered a pizza and walked to Spartan Stadium around 1:30. I walked around the stadium to the GA line, which seemed very calm and happy. It was right by the entrance the crew was using to go in and out of the stadium, so everyone assumed U2 would be arriving there – but it was the opposite end of the stage. 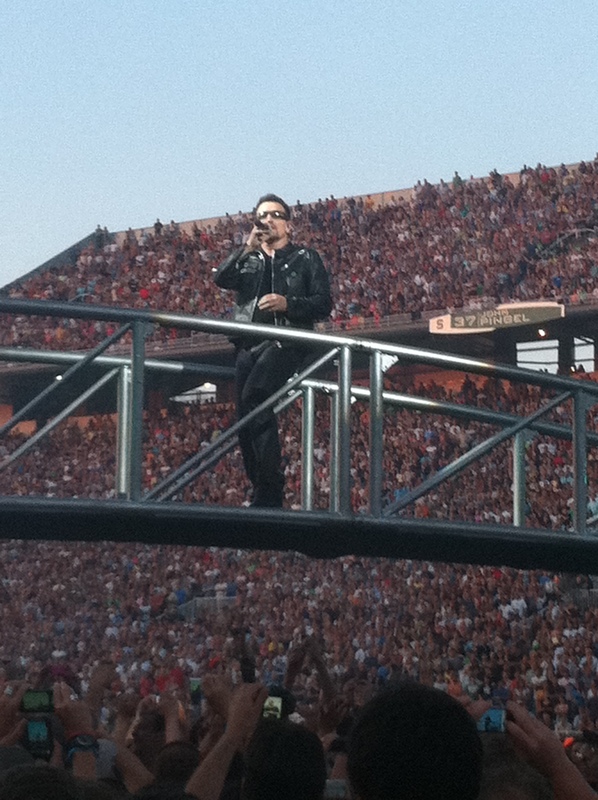 I walked around the stadium to see if there was anywhere else U2 could drive in. When I returned to where I started, Dallas and Sammy were also walking back. I asked Sammy if U2 were really arriving here in front of the GA line, and he said there was no else to come in. Then Dallas asked how I was doing and shook my hand. A little while later Rocco informed us that U2 was not doing a soundcheck, so this indicated to me that U2 was going to arrive very late. I decided to go back over to where the catering was set up and where the crew was going in and out of. There was no back stage in the stadium – no dressing rooms. They had set up ‘backstage’ at the hockey arena around the corner. I waited there, later joined by Beth and Tim. We stayed until almost 8 and nothing. We saw Florence and the Machine arrive and leave, but no U2. 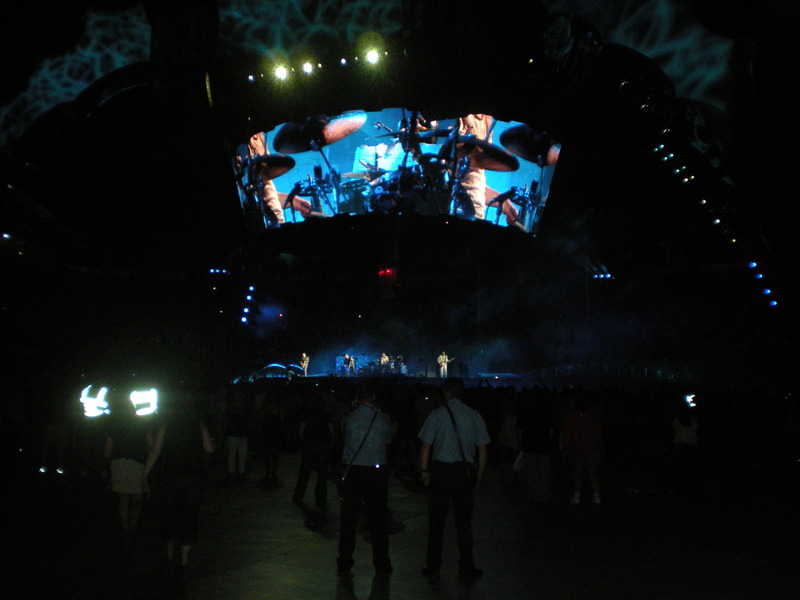 We learned later that U2 was driven right up to the stadium and let out there. 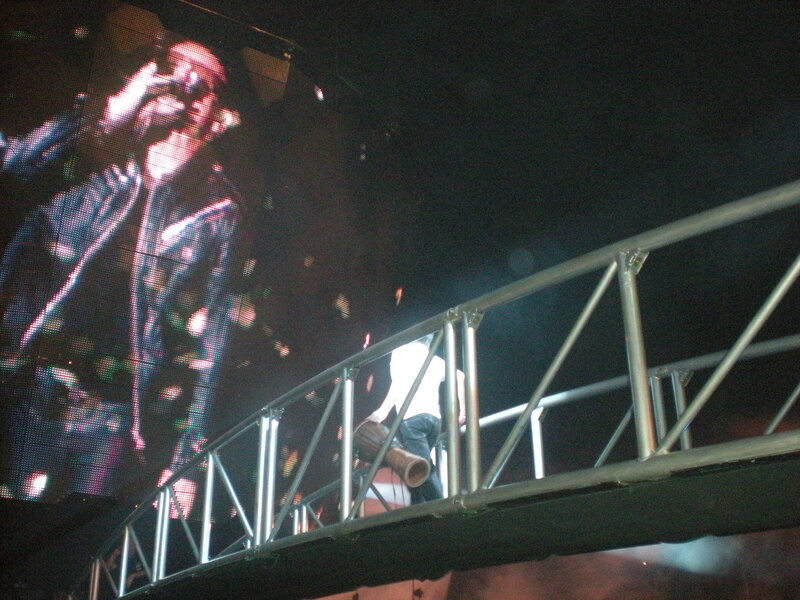 This U2 show in East Lansing was the halfway point of my 360 tour – 8 out of the 16 I’m seeing on this leg. I have met some great people and made some great new friends along the way. 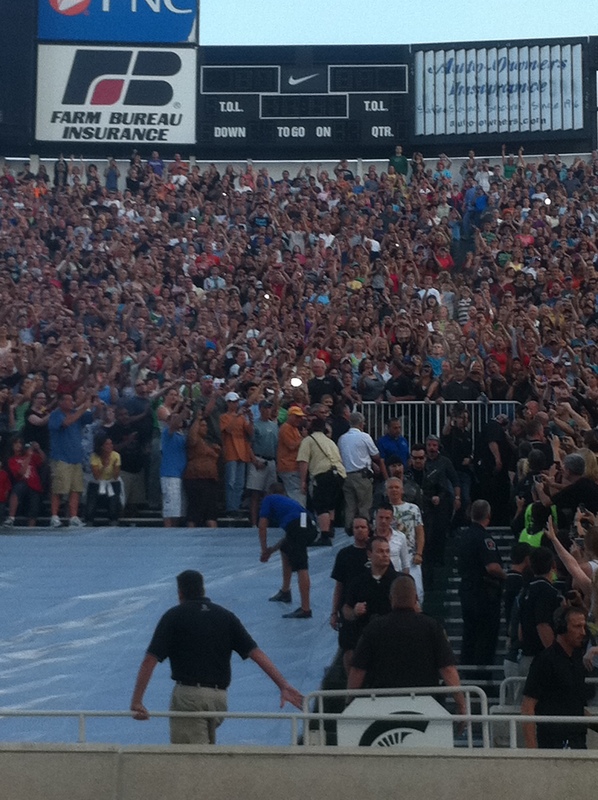 I’ve talked with Bono twice – about getting Larry to come out and greet the fans. 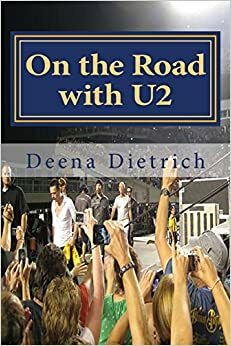 Bono stopped to greet the fans before the first four shows I went and hasn’t stopped at the last four shows – no one has. My ranking of my first 8 shows is as follows: Anaheim2, Seattle, Baltimore, Oakland, Anaheim1, East Lansing, Salt Lake City, Denver. Criteria for a good show for me isn’t always just about the music, it is about the whole feel of the show, the audience and quite honestly my Larry moments. Anaheim2 is my favorite show so far because for the first time this leg U2 completely changed the set list opening the show with 5 songs from Acthung Baby and changed the order of the other songs. Also, it was the first time this leg that U2 played my favorite song I Still Havent’ Found What I’m Looking For, and I cried like a baby. Seattle and Baltimore are tied as my second favorite shows so far. 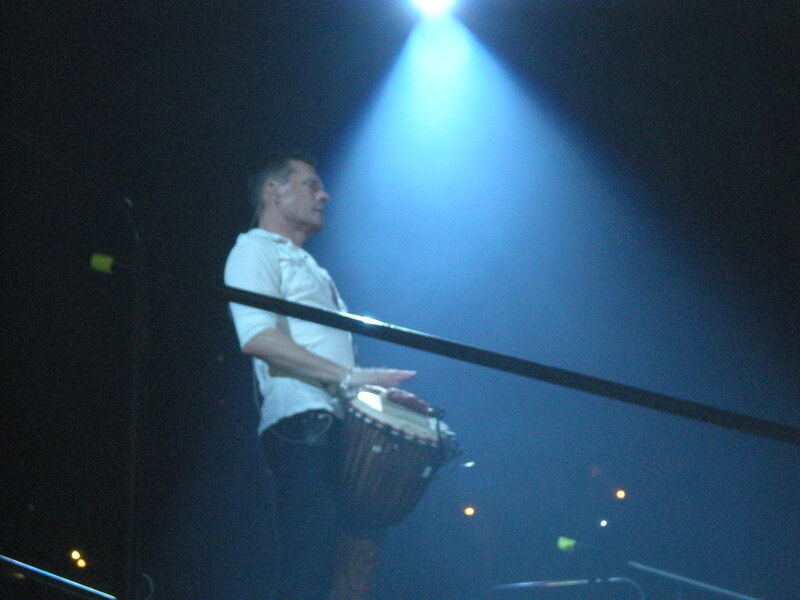 Seattle was great because Larry walked over to us as he was leaving the stage and shook my hand – he saw us standing there in our Larry Mullen Band shirts, smiled and walked straight toward us. Seattle was also great because I saw the show with my friend Jenny, and we had a great view of the stage from Edge’s side. 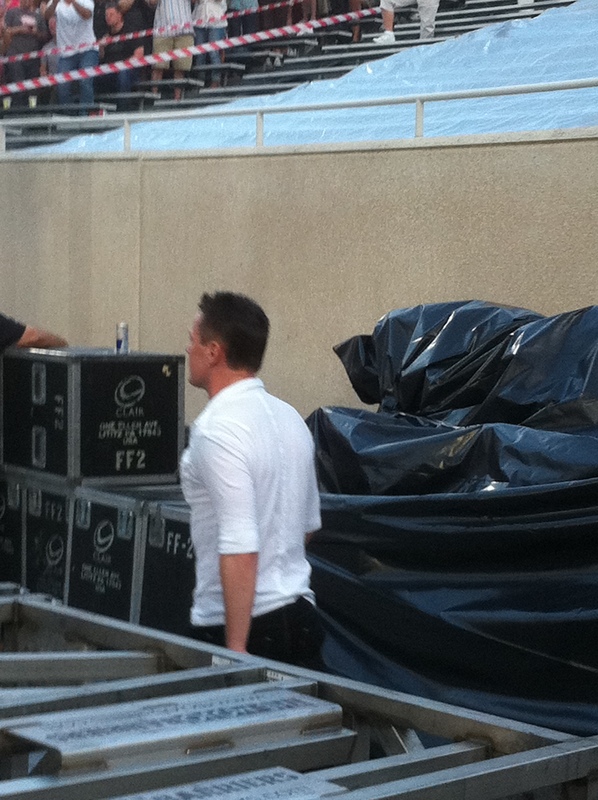 Oh and I spoke with Bono before the show about asking Larry to come out to greet the fans. Baltimore was great because it was the most enthusiastic audience I’ve seen and heard so far. Plus it was my hometown show, and I saw it with my friend Tasha. And oh yeah, I saw Larry rip off his shirt as he was walking to his car after the show. Oakland was a great show because Larry sang a bit of Lou Reed’s Perfect Day, and I spoke with Bono before the show reminding him to please ask Larry to come out and greet the fans – he remembered me from Seattle. Anaheim1 stands out because Larry smiled and waved at me as he entered the stage and when he left the stage. It was great to watch the show with my new friends Chuck and Michelle. During the introductions, Bono said Larry was the one they owe everything to. East Lansing was good because it was a really relaxed, not crowded show and the audience was really loud, especially for a small general admission. Also, the set list was similar to Anaheim2 and Baltimore, which is great. Salt Lake City’s highlight was Love Rescue Me – I cried. It’s one of my favorite songs, and I’ve never heard it before and U2 rarely plays it. Denver was cool because I was in the stadium where my beloved Broncos play, and it was the first show of this leg of the tour. It was also the first time I heard Zooropa and Scarlet. I’m excited to find out what special moments will happen on my next 8 shows. Starting tonight in Miami. Look for my review tomorrow – if I survive the heat and rain in Miami. Great Show! I had an oppourtunity to be part of the EMS staff for the night. I was stationed in the “inner circle”. I think you walked by us a time or two. Good luck on your quest this summer. Michigan’s economy has been hurting so this statium show helped give a boost the the Lansing area. Be safe. Stay safe, enjoy the air conditioning and complimentary fruits. Sun Life Stadium looks forward to your visit. For your convenience, below please find important event information to help you plan your experience. 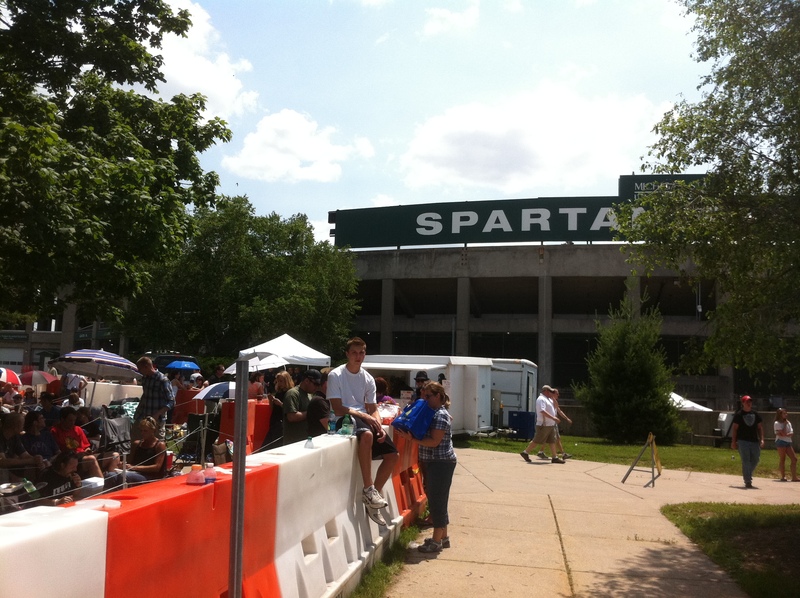 Unlike a football game, where fans arrive early to tailgate, we expect a late-arriving crowd. Also, since the concert is on a weekday, you will encounter the usual heavy afternoon and evening traffic. As a result, we highly recommend that you arrive prior to 6:30 PM as we expect heavy congestion between 6:30 PM and 8:00 PM. If possible, please carpool in order to alleviate traffic congestion and maximize parking spaces. If you have a colored Parking Pass, the color of the pass will determine which parking lot you can park in. For example, an Orange parking pass will allow you to park in any of the Orange parking lots in the interior or exterior of the Stadium. If you purchased a parking pass through Ticketmaster, you can use the parking pass at any of the Sun Life Stadium parking lots, including the overflow parking lots (see below) EXCEPT for Calder. Please note, the Ticketmaster parking pass will not be accepted at Calder. If you did not pre-purchase parking, parking will be $30 cash per car. Please bring exact change. In the event Sun Life Stadium parking lots are full, overflow parking will be available at Walmart but in designated event parking spaces. Please use the entrance by NW 26th Avenue and Dan Marino Blvd and only use the designated event spaces. Parking in other spaces may result in your vehicle being towed. Additional parking will also be available at Norwood Elementary School on Dan Marino Blvd. and NW 14th Court, just east of the Turnpike. Your pre-purchased parking pass will be accepted at these alternate parking lots while spaces are available. Cameras with lenses exceeding 8 in. If you do not wish to receive future emails from the Sun Life Stadium please click here.